July 4 is the American Independence Day typically celebrated with firework displays. NASA decided to celebrate with their own fireworks in 2005. 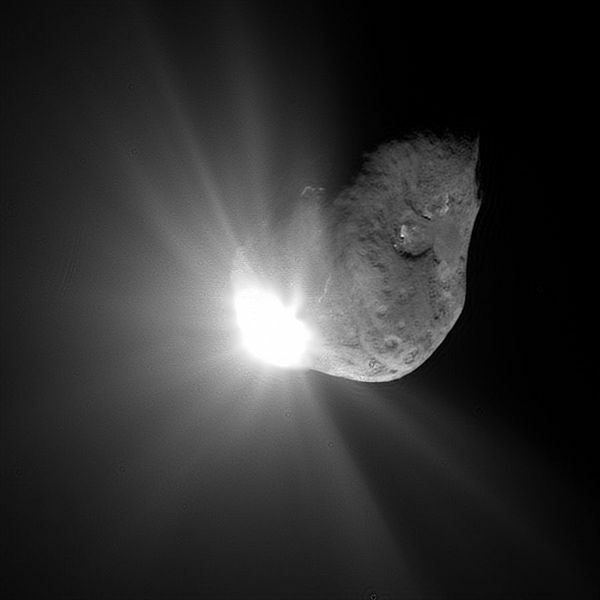 The Deep Impact spacecraft released the impactor probe to collide with the comet Temple 1. The 370 kg probe collided with the surface of the comet on July 4, 2005. The impact caused a 100 meter wide and 30 meter deep crater which ejected comet material into space. The ejected material scattered the sunlight and produced a spectacular light show. The Deep Impact probe and several large and small telescopes recorded the collision to examine the chemical makeup of the comet’s interior. The impact was a greatly anticipated event for astronomers. Some wondered if the impactor probe would punch clear through the comet and pass through the other side. Others wondered if the impact would occur at all. After the impact, the results were unexpected. The comet material contained a lot more dust than ice and the dust was much finer than expected. Analysis of the material showed the comet contained carbonates, sodium and silicates and was made up of approximately 75% empty space. The remaining part of the spacecraft was repurposed to fly by the comets Boethin, Hartley 2 and Garradd. NASA lost contact with Deep Impact on September 3, 2013. Not everyone was happy with the success of the mission. Russian astrologer Marina Bay filed a $300 Million suit against NASA for “ruining the natural balance of forces in the universe”. She felt the collision altered the magnetic field of the comet and could cause unforeseen effects here on Earth. The only unforeseen effect was losing her lawsuit.